If you’re not quite a guru yet, you sure will be after checking out what we have to say about paddle boards of all kinds! You can trust our expert paddle guru team to paddle you through every gritty detail there is about a SUP and compare stand up paddle boards on the market for sale, for both adults and kids. We even include ratings! Why? Because, we’re more than dedicated to the sport, we’re fanatical about it! Our solid SUP & inflatable reviews of paddle boards are helping you get as much out of your buy as possible, which means bodies on the water, kiddos outside and active, and a fun and fit way of life that embraces nature and the outdoors! Now, that’s a fantastic kind of fun and lifestyle! 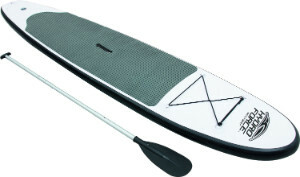 The Airtech is an inflatable paddle board that’s sold at beginner prices for pro quality. Built with Airtech Fusion-Lite Construction, it’s robust and rigid to handle any rocky shore you dare embark. For an iSUP, it’s conveniently easy to get to full PSI. 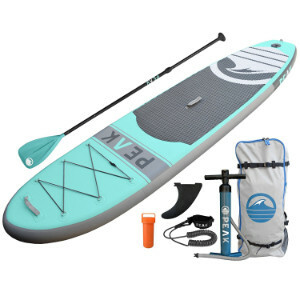 It’s also very lightweight at 19 pounds, has on-board storage, and includes the complete package, paddle and all! With the iRocker under your feet, it won’t matter if you’re a newbie to the sport or a veteran surfer – the iSUP is made for all! Pieced together with military-grade PVC and triple layer drop-stitch construction, you’ll have an indestructible water vessel for the lake or the ocean. If you need to drop a few pounds, forget about it! Flex won’t be an issue for weights up to 350 pounds! Besides, you’ll easily lose the flab when you rock it on the surf with this iSUP! 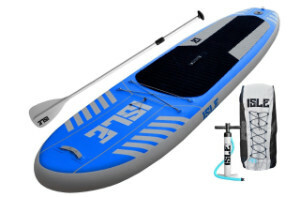 If you want the whole shebang out of an iSUP package, the Isle Peak paddle board is the way to go! 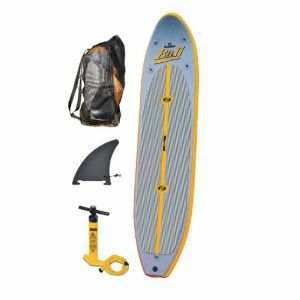 For incredible value, you’ll get the iSUP, paddle, dual action pump, backpack, coil ankle leash, and even on-board d-rings and bungees for storage! It’s the ultimate beginner’s package to get you out on the water immediately. It’s very lightweight, easy to store and transport, and super rigid to handle a 300 pound rider that’s mooning everyone in downward dog! Don’t let plantar fasciitis or any other condition get in the way of being active and having fun. What you need is a soft top deck that’s comfortable and provides enough cushion for your tootsies. The Isle Classic Soft Top is just that with its foam top and extra wide 33 inch width that makes it suitable for the entire family! Better yet, it’s also half the price of most SUPs, making it a comfortable purchase for the budget too! 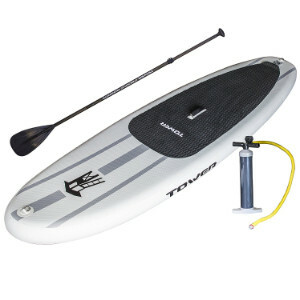 If you’re a name brand kinda buyer, then the Tower Adventurer is an inflatable paddle board that will tickle your taste buds. It’s strong, rigid, and practically immortal as you take it out in any water condition you dare to surf! You won’t be without protection either since Tower Paddle Boards includes a 2-year warranty on your buy. If you want the best of everything, you’ll find ultimate satisfaction with the Adventurer! What’s on your adventure menu this Summer? Sometimes a 9 foot or 10 foot board just doesn’t cut it for taller and heftier riders who are more daring than the rest of us. That’s why the cross-over Atoll 11’0″ Cruiser Deluxe is perfect for riders up to 300 pounds who are crossing into torrential waters where most of us would do a quick U-turn! Don’t forget your cooler of snacks and drinks since this thing has 14 d-rings on board! So, get lost and stranded and make your way ashore when you’ve run out of oreos! When budget is tight and your pants are too, the Bali iSUP is a win-win paddle board in both respects. It’s affordable, inflatable, and can comfortably handle paddlers up to 250 pounds! Wondering if you’re compromising on quality for price benefits? Be assured that you’re not. It’s pieced together with 3-ply 1000-Denier PVC fabric material and high-pressure drop-stitch construction. Like we said, it’s a win-win! 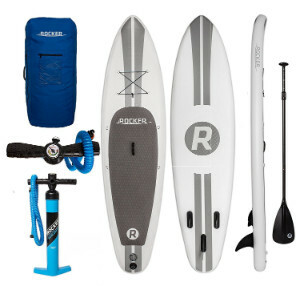 This paddle board comes with everything you need to take it home today, including an instant padded roof rack with straps to load up and out! 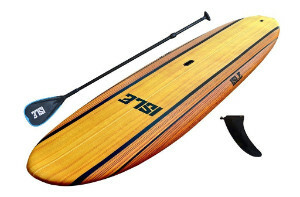 It’s a soft top SUP with heat-laminated layers for ultimate durability and comfort. If you like to buy your groceries at wholesale prices, why shouldn’t you buy your paddle board at wholesale prices too? That’s exactly what you’re doing with the CBC solid board! Cutting out the retail costs means more moolah in your pocket and more time on the water! If the kids have saved enough change in their piggy banks over the year, then let them splurge on the HydroForce inflatable SUP! It saves you from forking out a grand, and it gives them a chance to ditch the TV reruns and be active in the water. If you’re looking for some surf action too, it can hold up to 220 pounds. Let the teens roam and explore the depths of the lake or crest those small surfs with one of the best entry-level SUPs in the market. Let’s face it, you’re not going to spend in the triple zero digits for a toy for the kids. But, you will pay for an economical iSUP that they can inflate, tote, and deflate themselves! 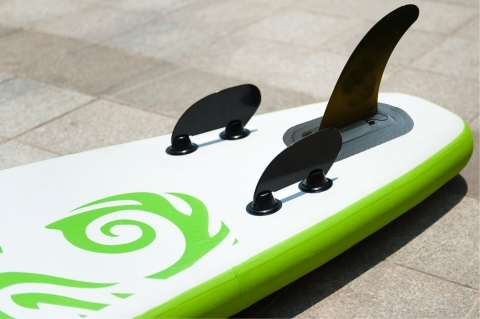 Let the teens do all the work to get out on the water with this beginner board. Don’t be worried about needing some guns to inflate it. Honestly, it’s a breeze to inflate – the kids will figure it out. With life jackets strapped on, they’ll have hours of fun cruising flat waters and snacking during their recreational paddling. Lesson one of becoming a SUP guru is to know what you’re looking for. Avoid being “that” person that buys a paddle board when you lack the right info! So, let’s paddle you through the types of boards you want to invest in! This is what you would want if you’re looking to hit the ocean breaks. They’re short, narrow, and plenty unstable for beginner SUPpers. But, for the more experienced riders that are looking for that adrenaline high from hitting the crest of a wave, a surf SUP’s dimensions are ideal for the surfer. They’re not made for long-distance paddling or even tracking in flat water, but they’re made for excellent maneuverability on the waves. These types of paddle-boards are excellent entry-level boards for beginners or for recreational use. They’re versatile and multi-purpose boards that can take you through a variety of water conditions as you build up your skills. Since they’re wider and longer than surf boards, they’re very stable for riders to learn to track and glide for flat water paddling or open ocean touring. You can check out a great fishing & touring board here. While many all-round boards are perfectly apt for flat water paddling, the flat water paddle board is specifically made for it. It’s designed to slice through water to maintain perfect tracking with its pointed nose. The shape is akin to a race SUP board that’s made for optimum speed and performance, but it’s wider to accommodate for beginners. If you’re a fanatic, then you’re probably out for a gut-wrenching core workout or you’re extremely competitive when it comes to speed. They’re very slim and narrow which is great for velocity on surf, however, it’s not recommended for beginners. It’s also unstable to use in flat water conditions. But, there’s no room for flat water for a speed freak! If you’re comparing the performance of a hard board to an inflatable, you’re looking at things with a narrow mind. iSUPs are excellent paddle boards but they truly shine when it comes to cost, storage convenience, and transportation benefits. Because they’re inflatable, they can be inconspicuously stored and shoved in the trunk of your car – all within a backpack too! iSUPs are also typically sold as an entire package with all the fixings to get you on the water without having to dish out for extra accessories. While many all-round and iSUP paddle boards can cater to SUP Yoga, there are specific paddle boards that are made a little differently for this calming but sweat-inducing activity. They’re wider and longer, and they allow for anchoring so that you’re not floating away while you’re in the middle of a downward facing tree pose! They’re often soft top decks that provide a little cushioning for your entire body. If river rapids sounds like your kinda style, then you’ll need the best SUP board that can handle the unpredictable terrain. Whitewater SUPping is dangerous, but it’s a ton of fun! These kinds of SUPs can come in a variety of lengths and shapes. Depending on these aspects, you can take a river SUP for surf and waves to the flat waters for recreational SUPping to even getting some time in for a little yoga. You either hate it or you love it! But, windsurfing has been a popular pastime for many ocean-goers! Most windsurf stand up paddle boards are compatible for use with and without the wind, meaning, if you remove the center sail, you can enjoy all the paddling you can dish out. Like the Whitewater stand up paddle boards, they’re a breed of their own. They come in a variety of sizes and shapes, and their ability to handle various water conditions depends on the build and dimensions. Lesson two of becoming a SUP guru is learning the specs to make a well-informed buy, buying cheap is not recommended unless you have done your homework. 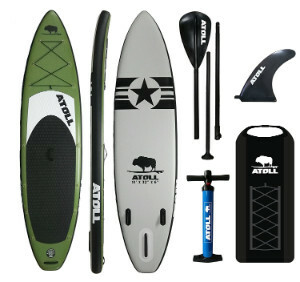 You probably want the best paddle board for the money, from materials and dimensions to fins, we’ll lay it all out! Discussing every individual component that comes into the construction of a stand up paddle board deserves a whole page of its own. To condense things for you, it really comes down to two types – solid or inflatable. These are made with PVC material for the exterior and a drop-stitch construction. This makes them extremely durable. Core materials and construction between varying iSUP brands are typically the same. Since they comprise of mostly air, they’re lightweight, uncomplicated to transport, and easy to store. These can be a little bit different from solid paddle board to inflatable paddle board and brand to brand. They can be made out of a variety of materials. However, the most common core materials are the ones we’ll discuss. Polyurethane Foam (PU): This is the original core material used for paddle boards until EPS came around. But, some people still prefer the soft foam because of the little bit of flex it provides in a solid board. It’s usually seen on entry-level boards or what you would call “soft top” boards. Expanded Polystyrene (EPS): Since 2005, this has been the most commonly used material for solid tops. They’re always combined with some sort of resin or epoxy coating for strength and durability. They’ll last longer than PU boards and are 60 percent lighter. Hollow Core: Some solid boards will feature a hollow core to maximize performance and reduce weight. The construction is unique as it’s a process of blow-molded polyethylene. These types of solid tops might be popular among whitewater stand up paddle boards for its toughness. Does size matter? It sure does! We’ll break this down so that you understand each aspect of size when it comes to paddle boarding. Why do you need to know volume? The volume which is represented in liters will tell you how much weight it can support while still being able to stay afloat. The more volume it has, the more it can hold. Here’s a quick formula to determine what level of volume you’ll need to keep your feet dry. The result is the least amount of volume you’d want in a stand up paddle board. For example, if you’re a beginner and you weigh 80 kg, multiply by 2 and you’ll need at least 160 liters of volume. The length of the board has a lot to do with performance and how you want to use the paddle board. Shorter boards 9′ and under are either surf paddle boards or they’re kids paddle boards designed for smaller riders. Medium boards 9′ to 12′ long are great for everyone of all skill types looking for all-round, recreational, flat water, and SUP yoga uses. Many all-round sups in the longer end of this range are great cross-over SUPs for versatile use in most water conditions. Long boards 12’6 to 14′ long are for those with a lead foot. Because they’re longer and slimmer, they’re excellent for speed or for touring when you’ve got several miles to paddle back to shore. When considering the length of your SUP, you’ll also have to take into account transportation. Is it short enough to strap to the roof of your car? Longer boards might be heavier and difficult to carry from the car to the water source, especially in wind, if you’ve got to hike in between. The width will determine the stability and speed of the board for users of various skill levels and the type of activity you plan on doing. Narrow boards of 29″ or 30″ are narrower than other boards making them less suitable for the beginner. Its width can be unstable for riders but they’re desired for its faster performance than wider boards. 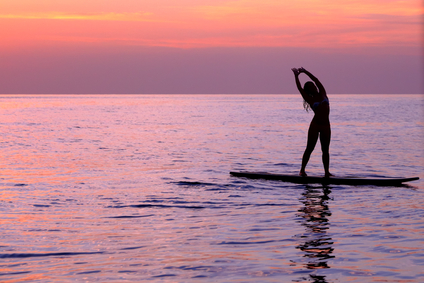 Wide boards of 31″ to 36″ are much more user-friendly for the beginner male or female Yoga paddle boarder since they’re easier to remain standing on. Where they contribute in stability they typically lack in speed, making them slower than narrow boards. To sum up size, you’ll have to take all measurements into consideration. Here’s a quick guide to sum things up! Match your type of most-commonly bought SUP with your weight for the right length board you’ll need. The same numbers also apply to inflatable SUPs. Be sure to check these specifications before you purchase. 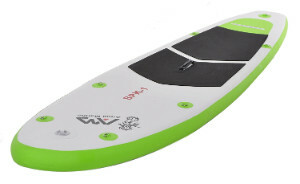 Fins are mounted on the underside of a SUP for tracking and stability. Sometimes they’re removable, sometimes they’re not. Here are the variations. A single, center fin is mounted into the underside of the tail of the board with a nut and screw. The rack it’s placed into is called a finbox that allows the fin to move back and forth. The Tri-Fin Setup consists of three fins. One larger one in the center and two smaller ones on the side. It’s also referred to as the thruster setup. They’re dual-purpose fins that allows for straight tracking when in flat water and excellent control when in surf. They’re a lot easier to remain stable and comfortable on for paddle boarding versus the lone, center fin system. These promote speed and help to maintain tracking in those downward swells for longer boards. These are often found on iSUPs. Some inflatable iSUPs will allow for only the center fin to be removed while the other two are permanently attached. The removable option allows for tighter rolling for compact storage without fin damage. However, fins are usually semi-rigid or made out of a flexible rubber that can easily be reshaped. Become a SUP Guru in the Making With Our SUP Reviews! 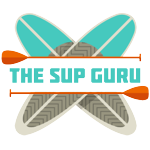 We’re in the business of making every water sport lover a SUP guru! It’s in your best interest to know everything about a water vessel that will bring tons of enjoyment for the entire family. Plus, you want to know if you’re getting a top rated product for a great deal! A SUP guru in the making is the start of a stand up paddle boarding lifestyle!